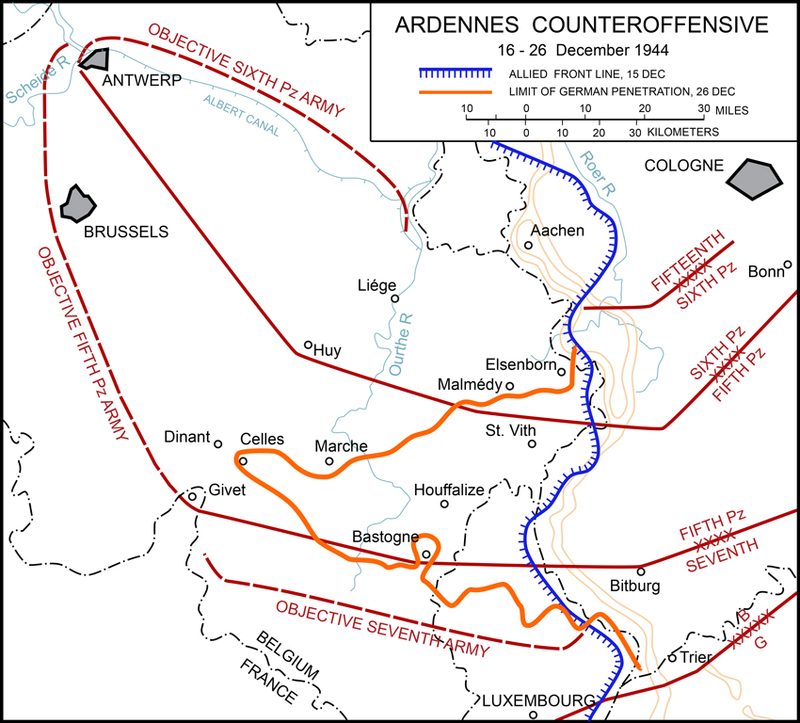 ARDENNES ‘44 : "The Battle of the Bulge"
The Germans officially referred to the campaign as Unternehmen Wacht am Rhein ("Operation Watch on the Rhine"), while the Allies designated it the Ardennes Counteroffensive. On 16th December, at 5.30 a.m. on a cold and foggy morning, from Monschau to Echternach, began the Battle of the Ardennes, today usually referred to as “The Battle of the Bulge”. On 19th December, General Eisenhower decided, with the agreement of Prime Minister Winston Churchill, to temporarily redistribute command responsibilities within his ground forces. The units deployed to the north of the line Givet-Prüm would be placed under command of Field-Marshal Montgomery, Commander of the 21st Army Group, and the units deployed in the south were to be commanded by General Bradley, Commander of the 12th US Army Group. Accordingly all Allied factions can use any troops from any of the other Allied factions in this theater. By this time the German Army suffered from an acute manpower shortage, and all the available forces had to be assigned where they were more needed. Accordingly all Axis factions can use any troops from any of the other Axis factions in this theater. Playable forces in 1-48TACTIC are divided in “factions” which do not necessarily map exactly on a nation armed forces, but are designed to represent an individual fighting force at a given time. For example the German expeditionary force in Africa in 1942 had a very different range of equipment, skills and morale than Army Group “B” in the Ardennes in 1944 although technically they both belonged to the "German heer" in "WWII". all Characters with the same symbol belong to the same faction. all factions that belong to the same alliance are considered allied. Every faction is always allowed to play against any other. In the case of two opponents playing with the same or an allied faction against each other the game is simply taken to be a military exercise. Would you like to host a 1-48TACTIC Tournament? We will be happy to support and promote your efforts in many ways! Player’s forces in 1-48TACTIC are organized by Theaters of Operation and all and only the Characters, equipment and vehicles that belong to allied forces or detachments in the same Theater are available for players to choose and compose their force with. Currently there is only one open Theater of Operations: Ardennes 1944. More will be made available soon, make sure to visit often 1-48tactic.com for more! As a general rule a player using any faction can deploy up to half -1 VP of allied troops within the same Theater (for example if you play the US Airborne in the Ardennes at 40VP you can have up to 19AP worth of US or British Infantry troops attached to your force). Please note however that this may vary depending on the units and theaters to reflect specific national and regional differences. All self-contained packs released individually rather than as part of a playable faction are called “detachments”. These can be used by any of their allied forces and do count toward the half -1 VP maximum allowed. 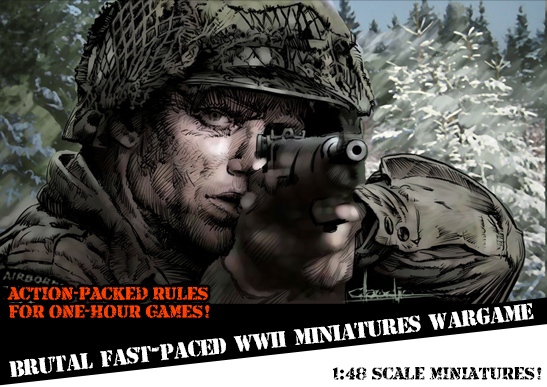 Mission packs are “stand-alone” mini-games which generally include special figures (again detachments), a booklet with scenario rules, specific victory conditions and a dedicated set of scenic items. They do require the core game rules and miniatures but otherwise contains anything else needed to play. Event organizers obviously are free to choose how to run their events, but what follows are a few general rules we hope will help! The tournament should specify the max number of AP allowed. Any number of figures and any amount of additional equipment can be used provided the total AP worth is within the max AP allowed. The minimum suggested AP total for a tournament is 36AP. The final score of each game is given by the sum of the total AP worth of all enemies killed plus the total AP worth of all own Characters that have not been wounded. Wounded on both sides are not counted. This score is calculated in the same way and awarded to both players (although obviously the winner will score more). The winning player will also receive a bonus of 1 additional point for every Character that was initially in the enemy force. At the end of the last round the player who has accumulated the highest score, as given by the sum of all individual game scores including all victory bonus, is the absolute winner.